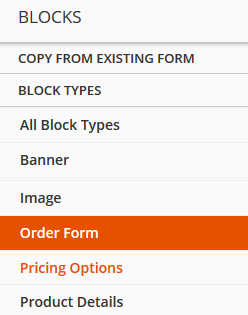 ONTRAforms use Order Form Blocks to create sales pages. Learn the steps to create persuasive order pages for all of your products and services. 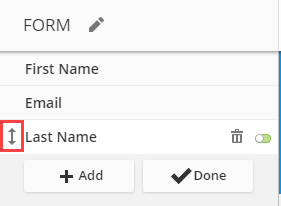 You can also add an Order Form block to any other ONTRAform template. 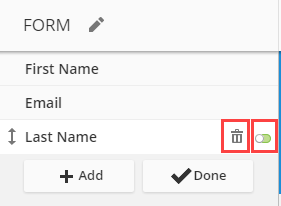 Click the + Add button to add fields to the form. Use the dropdown menu to select your desired field. Click Create New Field to add a new field to the Contacts database. Delete or hide fields by clicking the trashcan icon next to the field name in the Palette, or by sliding the green display toggle until it turns red. This does not delete the field from your Contacts database. Edit Section Titles and Toggle Items Off: Order Form blocks have section titles which can be edited for clarity. Locate the blocks in the Palette by looking for the word 'header', click the item to edit the text as needed. 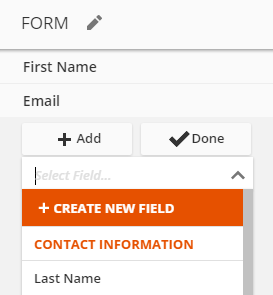 You may also use the toggle switch to omit displaying that field on your form. Order the fields: Ensure the section in the Order Form block is selected in the Palette by clicking on the section you want to edit. Hover over the left side of the field name. When the up and down arrow appears, click and drag the field into the desired location. Hide Address, Shipping Address Fields: The minimum required information for ONTRAPORT is the First Name, Last Name, and Email address fields. Note that your payment gateway may require address fields as well. Be sure to confirm the fields required by your gateway, otherwise all orders will be rejected. Hide Credit Card Fields: If your payment gateway does NOT require certain credit card information, slide the Visibility Toggle to the right position, turning it red. Note: Be sure to confirm what fields are required with your payment gateway. Hiding a required field will cause all orders to be rejected. We recommend leaving them in the default configuration, with green Visibility Toggle icons next to them. Credit Card Number (also called "Payment Number"). Payment Code (also called "CVV", "CVC" or "CVS" Code). Payment Expire Month (also called "Expiration Month" or "Exp. MM"). Payment Expire Year (also called "Expiration Year" or "Exp. YYYY"). To Hide, change or edit the Credit Cards Graphic: Click the pencil icon to use the Photo Editor. 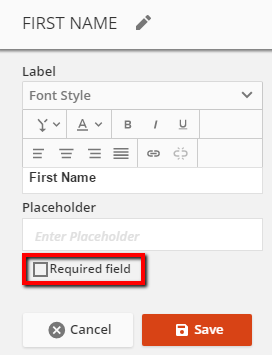 Make a field required: Click on the field name in the Palette and place a checkmark in the Required field box. Change what the field label displays: Click on the field you'd like to edit and enter your desired text. 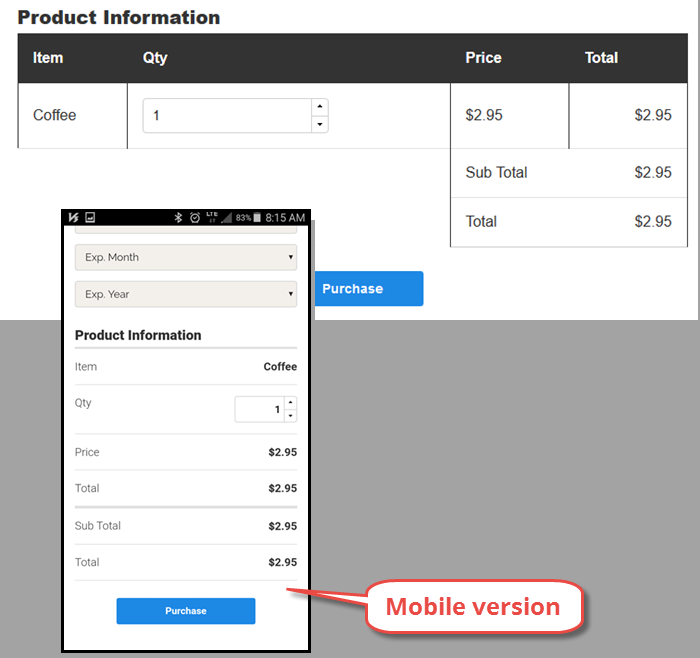 If the Order Form block you've chosen has text on the inside of the field, it's a Placeholder. Placeholder information disappears once the viewer clicks in the field. 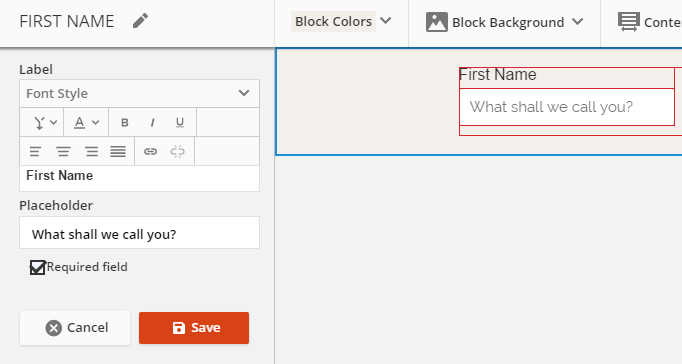 If the block you've chosen has text on the outside of the field, you can enter a new label for the field as well as enter placeholder information if desired. Placeholder information disappears when the viewer clicks in the field. Change the Submit Button: You can change the text and upload your own button image. Click the submit button element in the Palette in your Order Form block. Enter your desired text. You can change the background color and create hover effects by specifying different Hover Color Settings (text and background colors). To upload your own button image, click the image tab and upload your image. Now that you've added an order form block to your ONTRAform, add your products to sell and automate what happens after the order form is filled out. ONTRAPORT Order Forms have five options in the Advanced settings section. The default setting for all of these options is unchecked. Override email address and merge with cookie data - This setting overrides the default setting to merge all data based on the email address and instead use the cookie data stored in their browser. This is commonly used on regular opt in forms to allow the Contact to update their email address. Pass CGI variables to Landing/Thank you page - Usually used in third party applications or by developers, this setting sends the values in the form in a format that can be read by programming languages or applications. 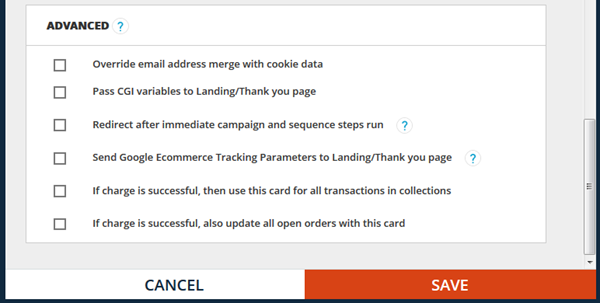 Send Google Ecommerce Tracking Parameters to Landing/Thank You Page - When enabled ONTRAPORT passes the parameters needed by Google's ecommerce tracking to the Thank You page. See Google Analytics Ecommerce Tracking for more information. If charge is successful, then use this card for all transactions in collections - When a credit card payment fails the order is sent to the Collections and Recharge Settings process. Your customer can update the credit card to be used in the Customer Center of an integrated WordPress website or by using an order form. Check this box if you are using an order form to update the credit card details for orders in collections. If charge is successful, also update all open orders with this card - This option will force a mass update of all open orders - subscriptions and payment plans - to use the card entered instead of the card originally used for the order. This can be handy when a customer needs to change the credit card for all of their orders. Note: If you are using an order form to allow Contacts to update their credit cards, please see the proper ways to do this in Collections / Recharge Settings. If the display is less than 768 pixels wide the product grid section will stack the fields for easier display and interaction. Most desktops and tablets will display the normal grid layout, and mobile devices will display the stacked alignment.